Some watches are only meant to be stylish and sporty, and others are designed for far greater things. The Tag Heuer Grand Date Formula 1 Men’s Chronograph WAU1112.BA0858 falls into that second category. This is a watch that looks smart while measuring speed, time, and safety. This is a purchase that will pay off in both substance and style, although some consumers have had trouble with the crown and winding stem coming detached. It’s something that can be fixed, and it may not happen to you, but it is a concern if you’re going to make the investment. I’ll start with the watch’s rugged good looks. The Tag Heuer Grand Date Formula 1 Men’s Chronograph WAU1112.BA0858 has got a black face surrounded by a unidirectional stainless steel bezel. The bracelet is stainless steel. The hands and markers are luminescent for increased visibility. It’s easy for a watch that has this many functions to look cluttered, but the high contrast design looks sharp and orderly. A spiral pattern accents the small dial, and everything is easy to see. Invicta offers an alternative with all the dive functions but no tachymeter. 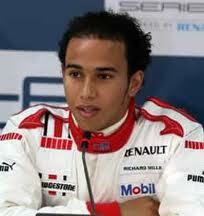 Although the watch is meant to evoke the excitement of Formula 1 racing, it also has dive elements. The rotating bezel can be used to measure elapsed time under water for safety, and the watch is water resistant to 200 meters. If you do use it for diving, keep in mind that Tag Heuer recommends you get the seal checked at least once a year. The last thing you want to do is to drown a watch that’s this cool. Lest you think this is only about the water, the tachymeter measures speed, and a chronometer is included for stopwatch functions. This would be a great watch for a sportsman, and it should be pretty sturdy–the sapphire crystal is scratch resistant. The stainless steel case and band should hold up well to everyday wear and tear. 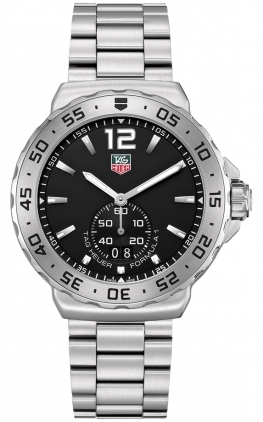 Tag Heuer gets generally good marks for its Swiss movements, and they chose to use a quartz movement on this one. It’s a good choice. Although many luxury models use mechanical movements, a quartz movement is a tiny bit more accurate. When a watch is meant as a precision measurement device, it’s nice to have something that meets the most scientific standards. Although the watch generally functions well, there are some reports of the winding stem and crowns becoming detached. I saw only three or four complaints, so it’s not universal, but if you do buy make sure you get a good warranty so you’ll be covered if it happens to you. 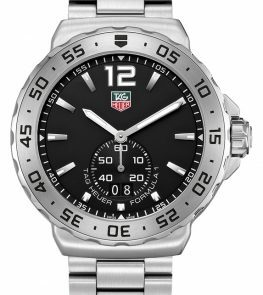 If you like this watch, but you’re not a fan of the black dial, Tag Heuer makes the very same watch with a white dial under model number WAU1113.BA0858. 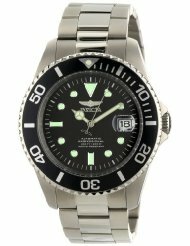 If you want something that has a slightly different look but all the dive functions, you might go for the Invicta Pro Diver Titanium Men’s Watch, which retails for $795. Be aware that the Invicta does not have a tachymeter, so if that’s important to you, stick with the Tag Heuer model. The Tag Heuer Grand Date Formula 1 Men’s Chronograph WAU1112.BA0858 is everything a sporty man needs in a luxury watch. It has a lot of useful functions, and it looks good while being strong enough to accentuate an active lifestyle. As some users do report small problems with the winding stem, it’s especially important to get your warranty with this model, and different retailers will give you different deals. Most people say that they love the watch, and seem to have no problems, so I wouldn’t let it stop you if this seems like the timepiece for you. Now you’ve just got to decide which of the functions you want to use first.